When you type a period (.) after a variable that is a reference-typed variable, Intellisense in Visual Studio will display a list of relevant class members. 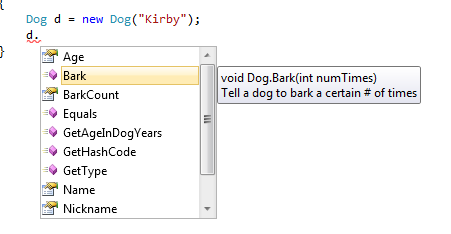 In the example below, the variable d is an instance of the Dog class. When you enter a period (.) 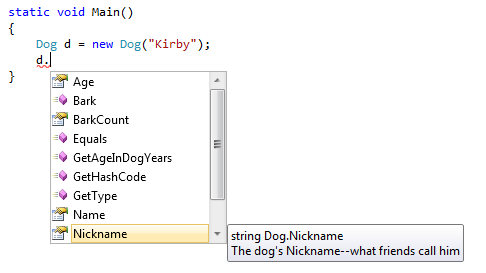 after the variable name, Intellisense displays a list of the members of the Dog class. This includes both methods and properties. You can use the arrow keys to select a specific class member. As each class member is highlighted, information about the method or property is display to the right.